Childcare provided for infants through age 5 yrs. 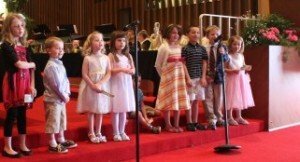 Children’s Sunday School: 10:00 – 11:00 a.m.
Melody Makers, our children’s choir, rehearse in the choir room with Mrs. Dyke before moving to the High Voltage room. High Voltage, our children’s Sunday School program is a crazy and fun way to learn about our Lord and how to live as He wants us to. The Diaconate is happy to arrange rides for those who need transportation to and from church on Sunday. If anyone would like to arrange for a ride, please contact the church office at 309-682-5491 or by email at Transportation to Church. This is the Lord’s Table. All desiring to participate are welcome. In our Baptist tradition, the bread is passed to the congregation. When all have been served, we partake together. The same procedure is followed for the sharing of the cup.